Thanks to a generous sponsorship from the Undergraduate Student Government in May of 2013, University Libraries acquired the Makerbot Replicator 2x, a dual-extrusion 3D printer. The printer is currently being managed by and housed in the Student Multimedia Studio, located on the first floor of the Kent State University Library. Printing capabilities are open to all currently enrolled KSU students free of charge. After realizing the increased demand and popularity of the service, University Libraries has purchased two additional 3D printers and has continued this free service. 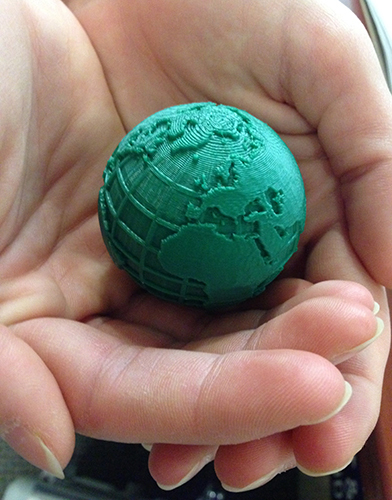 This guide contains information on 3D printing at the SMS. In it you will find our printing policies and procedures, along with information such as FAQs, a glossary of terms and links to free 3D modeling software. Follow the left-hand navigation to access the various pages. If you have any questions about the process or 3D printing in general, check our 3D Printing FAQs page or contact us at 330.672.0221. You are also welcome to visit us in person at the Student Multimedia Studio, located on the first floor of the University Library. The copyright law of the United States (Title 17, United States Code) governs the making of photocopies or other reproductions of copyrighted material. The person using this equipment is liable for any infringement. 3D printing services at the Student Multimedia Studio (SMS) are available for lawful purposes only. United States intellectual property laws, including copyright (Title 17, USC), patent (Title 35, USC), and trademark law, govern the making of reproductions of materials protected by law. Kent State University reserves the right to refuse any 3D printing order if, in its sole judgment, fulfillment of the order would involve violation of copyright, patent or trademark law, or if such printed material would pose an immediate threat to the health, safety or well-being of others.